Railway track workers are in imminent danger of being hit by trains. Recent cases include accidents in Germany, the USA and many other countries. Infrastructure construction and maintenance companies reduce this risk with human (e.g. safety attendants) and technological (e.g. warning horn with wired contacts) efforts. Drawbacks of this approach include overhead costs for additional employees as well as complexity in handling the technology. Despite all these efforts, there are many 10 up to several 100 track worker accidents every year caused by being hit by a train in some regions of the world. 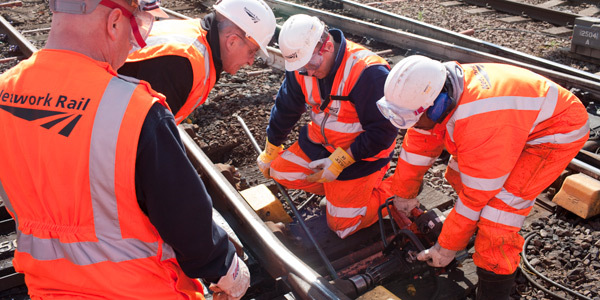 Thus it is highly recommended that track workers will also be fitted with a personal version of our protection technology, minimizing the likelihood of collisions with approaching trains. In fact it is our vision that everyone who wears a reflective west should also wear a personal protection device. 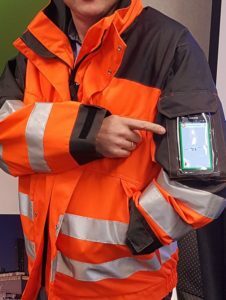 This can be as simple as using our track worker protection app on the track worker’s smartphone. Due to the potentially long braking distances of approaching trains it is of at least equal importance to warn the human worker of the approaching train as the human can de-escalate a potential threat situation usually much faster. In this way, we will enhance existing railway safety systems with new technology and increase overall operational safety. Our Track Worker Protection App was recently awarded to be the winner of the IEEE Vehicular Networking Conference (VNC 2016) App Contest. Download the flyer of the smartphone version or the apps datasheet. Update 27.10.2017: One more recent example, why a personal protection system would be highly valuable in German news.